Blogging is not limited to high-quality content sites, as there are many of us who blog for fun and write all different kinds of content. Maybe you run a lyrics website or you are curating content from different sources and placing it all on your own website. The problem with these not so high-quality content sites is they never get approval for contextual ad networks like AdSense or Media.net. So, how can these sites make money? Well, your best bet is to look for AdSense alternatives and non-contextual ads. One such ad is a “pop-under ad” which is a very popular type of ad for free download sites. Well, that’s a pop-under ad, and this kind of ad is very popular among advertisers & publishers who use CPM-based ads. A few days back, I published a list of the best CPM ad networks, and today I’m extending the series with an overview & getting started guide of ClickADu. This is a pop-under ad network similar to Popcash where you can expect to see all different kind of ads (including adult ads). And the earnings are pretty decent. The best part is minimum payout is onluy $10 & they offer plenty of payment options like Bitcoin, ePayments, Epese, First Choice Pay, Paxum, PayPal, Payoneer, Webmoney, Wire. You can’t use these ads with AdSense or Media.net. So if you are someone with a banned AdSense account or are running a kind of website where you can’t get Media.net or AdSense approval, ClickADu is certainly worth a look. Once you are signed up & logged in to your ClickADu dashboard, click on Sites and zones and add your domain name. If you are using BlogSpot, you can do this by editing your template file. If you are using CloudFlare or any cache plugin, do flush your cache. Click on Prove ownership and within seconds, your domain will be added to ClickADu. If nothing happens after you click, don’t worry. Simply wait for a few minutes and you will get an email once the system finds the tag. After receiving the email, you can remove that approval code. With this, you have completed the submission process. Now, the ClickADu team will manually review your site, and within 24 hours, you will be accepted into the program. It took about 6 hours for me to get the approval email. Once you receive the email, you will get the script that you need to add to your site. You can add it using the same plugin or you can use Google Tag Manager (GTM). I personally like GTM as it makes tag management easy (& it’s free). I was able to test the pop-under ads within 30 minutes of adding the codes. These kind of ads are great for entertainment sites or sites where content is not the primary focus. Usually, you will see pop-under advertisements on free movie sites, download websites, or sites where some kind of content is distributed for free. These kind of ads are great for making money from all different kinds of traffic. For high-quality websites, I would suggest not to use these kinds of ads as they will put your readers off. Quality websites should use contextual ads offered by AdSense, Media.net, or another similar network. With ClickADu, you can expect to see some adult ads which are definitely not compatible with AdSense. So, ensure you do not use ClickADu on a website running AdSense ads. Note: Popcash is a very similar ad network. Well, since I don’t have the kind of website where I can run these ads for a long time, I couldn’t test the overall earning potential of ClickADu. 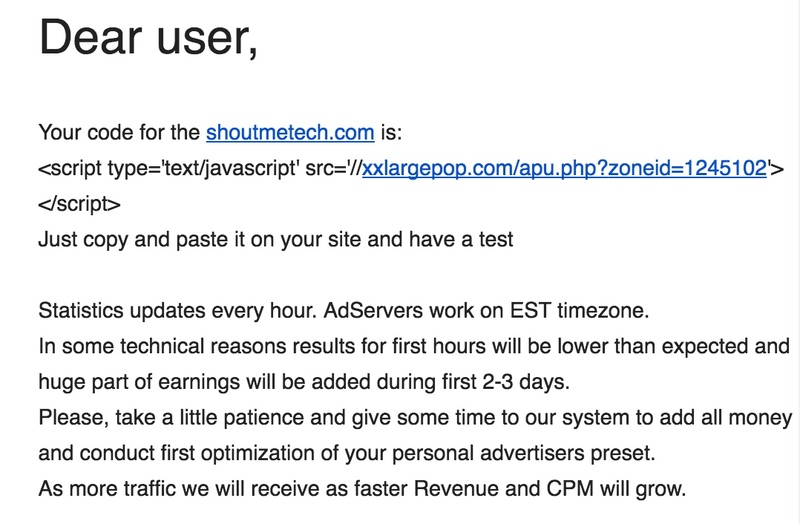 However, from my limited interaction, it seems like a solid pop-under ad network that you can try out. I hope this ad network will be helpful for those who don’t have an AdSense-friendly site or are banned from using AdSense. I would suggest you use another ad network like Infolinks or Propellerads along with ClickADu to ensure your website generates revenue to its full potential. Clickadu can make great money for any kind of traffic. ClickAdu alternatives are Popcash, Propellerads. So let me know: Have you used ClickADu or another similar pop-under ad network? What has been your experience & how much money have you generate every month? Share your experience in the comments section below as it might help someone pick the right ad network for their blog! Amazing information , but the earnings from this network will be equal to adsense earnings? That is hard to guess as it depends on many factor. However, in most of the cases AdSense would pay better. If you are looking for an alternative ad network which can pay better than AdSense, you should look at PropellerAds. However, again these kind of ads are annoying so use it with caution. I am new to blogging and working on my site to attract traffic, but gathering ad related information is also going on parallelly. Your blogs are providing credible information on all topics including the current one. With Images only website, getting the AdSense approval is gonna be tough. Thanks for the nice one for about AdSense. I started a blog recently about the niche is BloggingAdvise. Can will make better with AdSense or affiliate? The affiliate would work out better. I try many Popunder ads like revenuehits, propeller ads, popads and much more but my hope to get more CPM is never satisfied and I still find some best popunder ads network. Hi, I always trying to be a good blogger. I have writing skill in my regional language (Assamese). Is it possible for me to be a good affiliate marketer? Best Information About Clickadu Ad network. sir your article is good enough if anyone want to migrate email list from aweber to convertkit. But sir please can you give me a suggestion about how to migrate from blogger’s feed burner to other email marketing company. However, one limitation with Feedburner is that they don’t register name of the user. So you need to plan your email content accordingly.